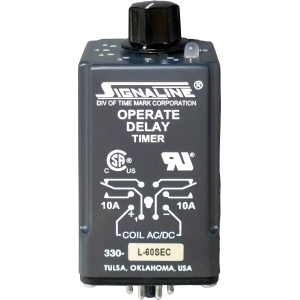 The Models 330 and 360 Operate Delay Timers are designed for a wide range of industrial applications. Examples include automatic and machine tool control circuits, HVAC circuits, and warm-up delay circuits. The Model 330 is a DPDT potentiometer (knob-adjust) timer. The Model 360 is a DPDT, high-accuracy digital input timer. Solid-state timing circuits in each model drive an internal electromechanical relay. Each model is functionally interchangeable. They are available in a variety of voltage and timing ranges to cover all possible applications. An SG version of this model is available using silver with gold flash contacts. Models 330 and 360 are UL Recognized and CSA Certified. 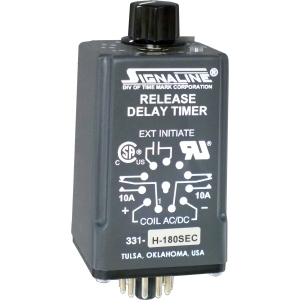 The Models 331 and 361 Release Delay Timers are designed for a wide usage in new or replacement industrial applications. Examples include delay-off circuits, batch processing circuits, and other applications requiring a remote-triggered, off-delay timer. The Model 331 is a DPDT potentiometer (knob-adjust) timer. The Model 361 is a DPDT, high-accuracy digital input timer. Solid-state timing circuits in each model drive an internal electromechanical relay. Each model is functionally interchangeable. They are available in a variety of voltage and timing ranges to cover any application. An SG version of this model is available using silver with gold flash contacts. Models 331 and 361 are UL Recognized and CSA Certified.